Over on the Funcom investor relations page we caught wind that their flagship MMORPG The Secret World is getting a “relaunch” of sorts very soon. It hasn’t been officially announced on their blog or game update page so the investor presentation slide will have to do. 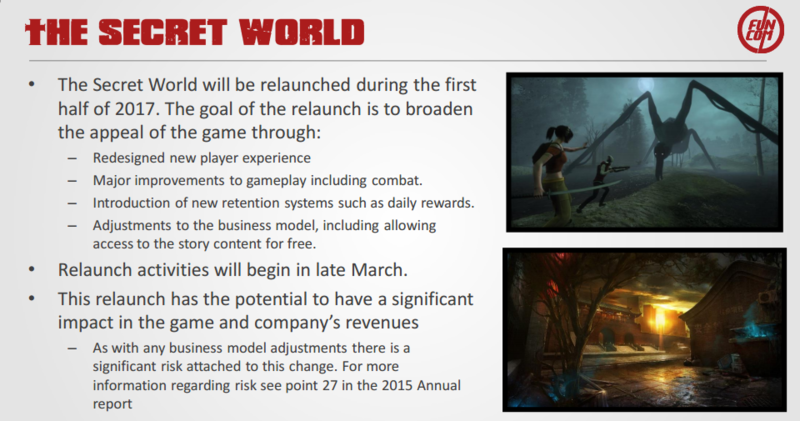 It seems Funcom is interested in revamping The Secret World to reflect current trends in the gaming industry. Originally released on July 3, 2012 the modern day massively multiplayer title certainly shows it’s age. The relaunch is expected to increase revenue by broadening the appeal of the game while also bringing more attention to it during this period. The Secret World’s unique story draws on conspiracy theories and urban legends garnered from the real world. The relaunch is planned for late March of 2017. Check out some of the major changes below.